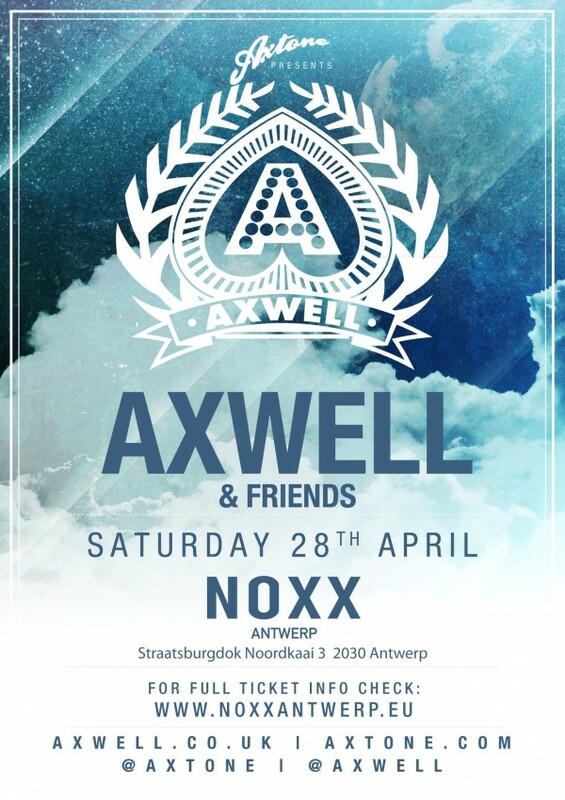 So Axwell lovers, we are finally done with editing all the video we did last video at Noxx in Antwerp and The Sand in Amsterdam and we hope you will enjoy them a lot. First off all – it was a fantastic trip and the whole weekend was just great. On Saturday, 28th of April, we took a 450km drive from Braunschweig to Antwerp and after 4,5 hours of driving while enjoying some older sets from 2006 -2008- e.g. Steve Angello & Sebastian Ingrosso at Coloursfest Glasgow 2006 – we finally reached our hotel. It was about 4pm and after some minutes in our room and checking the TV channels, we went to a supermarket, ate something at Quick and when getting back to the hotel we just relaxed. At 11pm we were ready – hyped as always – and drove to the 10km far away club called Noxx. On the other side, there was a special built booth for the man himself, Axwell, and this was totally crazy. It had about 7 co2 jets, pyro/fire effects and a huge canon for the confetti. To be honest, that’s really really massive stuff when it comes to a club. You might find co2jets as a gimmick in a club but especially in smaller German clubs you won’t find that plus pryo! At 1.45, Axwell started his set with an intro edit of “Greyhound” including the “Antwerp are you ready?” vocals. The crowd went nuts compared to their moving before which maybe was caused by the amazing combination of energetic music and the special fx. Besides the latest Swedish House Mafia single he played the edit of “2Night” by Eric Prydz, combined with the “Together” vocals, the freshest Axtone single by Henrik B called “Leave A Light On” as the NO_ID remix, “In My Mind”, “Antidote” by SHM, “Calling”, the Alesso ID 3 and of course many many more. A highlight was definitely that he played out the Thomas Gold remix of Miike Snow’s “The Wave” which will be out on May 14 through Axtone but there were plenty of highlights. As we said before we did the trip, we recorded some footage for you but this time it’s only 15 minutes long but it should give you a very good impression how we enjoyed the night. At around 4 am, Axwell left the stage and we decided to drive home to be fit for the next day. Sunday, 29th of April, taking a shower, eating some breakfast, getting a coffee, Autobahn here we come. After 1,5 hours we arrived at our hotel at 3 pm. If you would go there in the summer you can enjoy two great pools outside. The hotel seemed to be pretty far away from city but actually the central station was only 25mins away by feet so we decided to check out the beautiful city but actually the whole city was overcrowded because the Dutch people celebrated the Queensday on the following monday so we just took some food, stopped by at a supermarket and went back to the hotel. At 11pm and a drink at the hotel bar we drove to THE SAND and after passing the entry we were really overwhelmed. The venue was totally different as it was a off location and more like a concert hall. So the booth was placed on a big stage and it was surrounded by a huge LED wall and – of course – an armada of effects. The warm-up djs played some very hard stuff for a warm up but the crowd all in all enjoyed it and was ready for Ax. Around 2 am, Axwell took over and of course started with the “Greyhound” intro edit as well but he played a lot of other tracks like the Dirty South remix of “Devil’s Work” by Miike Snow or the Midnight City remix by Eric Prydz to name a few. Another highlight, which he by the way played at both gigs, was an edit of “Leave the world behind” and the “Ladi Dadi” remix by Tommy Trash. 2 hours later after playing plenty of good tracks which were combined with a lot of special effects, Axwell finished his set and the reactions by the crowd were simply good. Thanks to Axwell, Peter, Noxx Antwerpen, The Sand Amsterdam!